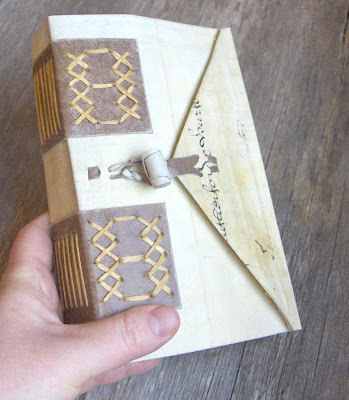 I was asked if I could make a blank book in the same manner as a particular limp vellum ledger binding from 1670, which can be viewed online at the Conservation Studies website for the University of Texas at Austin. Of course, I said yes. 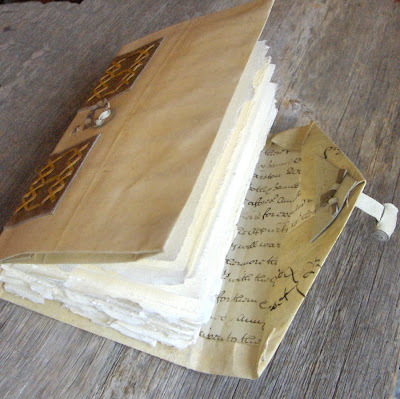 Using an old parchment document for the cover (above), I was able to make a very old-looking replica. 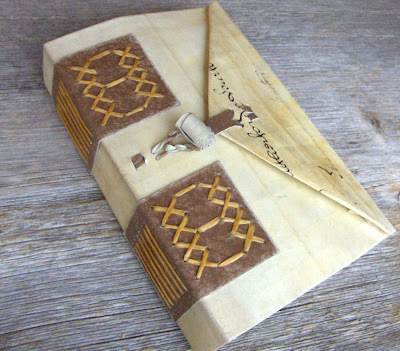 On the original book, the decorative stitching was most likely done with narrow alum tawed strips; but, lacking a source of alum tawed skin, I used pigskin leather for the loop and toggle, and artificial sinew for the stitching. For the blank pages inside, I used Old Master paper from Saint-Armand. Needless to say, that project ranks among my most favorite. If only I could have kept the finished book for myself...but alas it is gone off to the person who commissioned it. But I wish I got more requests like that. Wow! Very beautiful book and very cool that you were able to replicate it so closely. Thanks for showing this! wow! what a project to get commissioned for! you did such a great job! Wow! this is so great Rhonda! I really love the cover - it looks so good! Well Done! 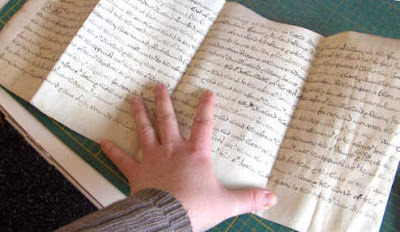 Nice job, and using the old vellum that way is totally authentic. Now, make one for yourself! (www.hollanders.com) so you can be sure of its quality. Cover looks very perfect, Cover making is your profession>? Well, I suppose my profession is "bookbinder" or "book and paper artist" - it is difficult to commit to a title!